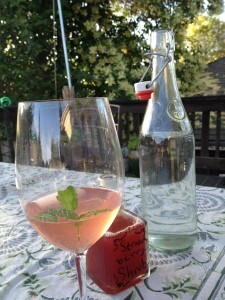 Shrubs are vinegar and fruit syrups that, when mixed with sparkling water, create an interesting- and historical- drink option for summer sipping. As I prepared to host a casual backyard barbecue at our place in Napa a few weeks ago, I realized I was tired of my go-to non-alcoholic drinks. Sparkling water. Yawn. 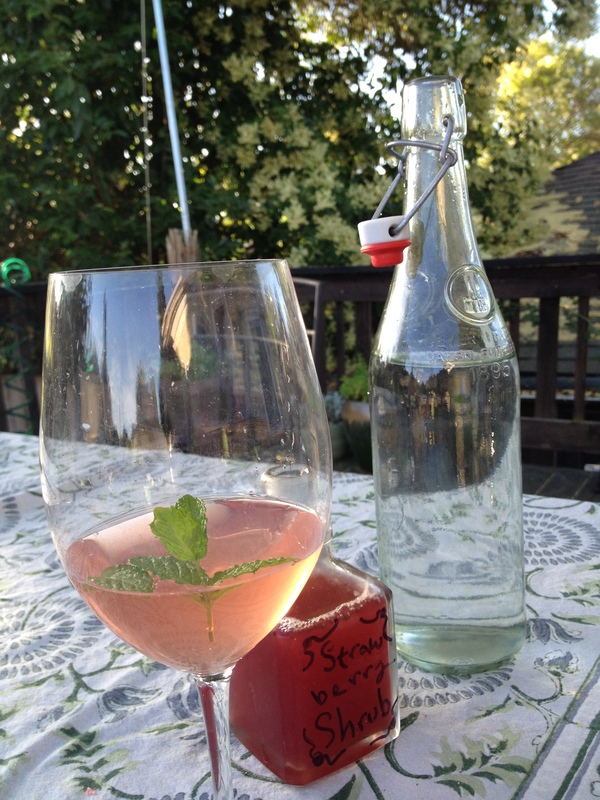 Sparkling water with juice and a twist. Double yawn. And then I remembered a conversation I’d had with Matt Kettmann of the Santa Barbara Independent and now new Central Coast Wine Guy (not his official title) for Wine Enthusiast. We had met for lunch at Finch & Fork in downtown Santa Barbara a couple of months ago when I was home for vacation. Refreshingly, rather than the usual winemaker-wine writer shop talk (“How’s harvest looking?” “This wine has 30% new oak.”) we found ourselves chatting about home winemaking, Santa Barbara’s exploding tasting room scene and….shrubs. No, these shrubs are not the kind you prune or the kind you bring The Knights who say “Ni!” but the kind you drink. Stemming from the Arabic word sharāb, which means “to drink,” shrubs have their origin in the Middle Ages as an herbal medicinal beverage and then emerged into seventeenth century Europe as a concentrated syrup made of vinegar, water and sugar. As a lover of food and drink history I have long enjoyed researching recipes from such sources as Jane Austen’s family “receipt book” and Victorian housekeeping manuals. Over the years I’ve come across recipes for sundry shrubs and “cordials” in these antique cookery books. The concept is easy to understand from an historical householder’s point of view. 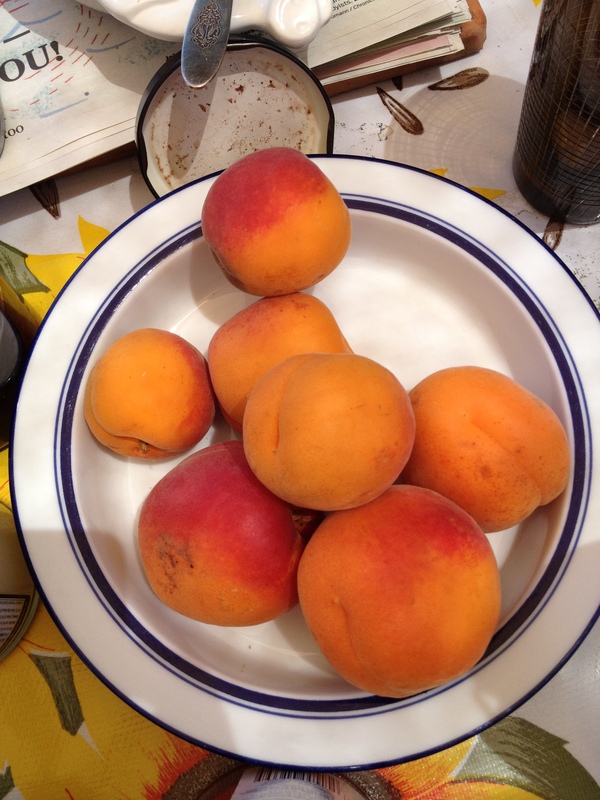 Submerging ripe summer fruit in a solution of vinegar and sugar helped preserve part of an abundant (and quickly-spoiling) harvest while creating a tart, fruit-flavored liquid as the fruit macerated in vinegar over time. In an era before commercial sodas and prepared cocktails, mixing 1-2 oz. of this “drinking vinegar” with about a cup of cold or sparkling water (which was increasingly available in the eighteenth century) created a refreshing, flavorful drink. 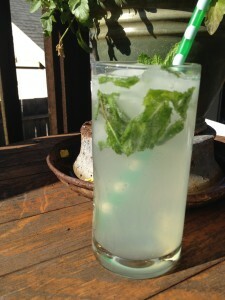 Mint makes the perfect aromatic garnish for iced fruit shrubs. Today, shrubs are enjoying a renaissance in trendy restaurants and bars (especially, it seems, in produce-rich wine country) but you don’t have to travel to someone else’s watering hole to enjoy these handcrafted sippers. I started experimenting with shrubs in my kitchen because I was looking for interesting (but low-calorie, natural and non-alcoholic) beverages to enjoy with my family and guests. What I’ve found is that making a fresh fruit shrub is cheap, easy and delicious. They can be thrown together from ingredients and with equipment you probably already have on hand. 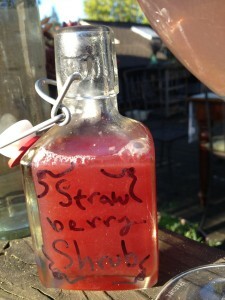 Below is a “Pick-a-Fruit” shrub recipe that I’ve developed based on historical techniques to utilize whatever fruit you can rustle up at the farmer’s market or in your backyard. Call it the “Choose-Your-Own Adventure” of DIY beverage-making. I started with wine-based vinegar (naturally) but don’t be afraid to branch out into other interesting vinegars (I even experimented with a banana vinegar sold by Rancho Gordo!). Beware of balsamic vinegars and their ilk since they will mask the pure fruit flavor and of course can be quite expensive. Use organic produce if possible and don’t be afraid to tweak the amounts given. The key thing is for the fruit to be completely submerged in the vinegar during the week’s maceration time. Fresh strawberries and red wine vinegar are a delightful combination. The level of sweetness is up to you. Some of the old recipes call for a 1:1 ratio of fruit, vinegar and sugar but as I prefer my drinks drier (my friends know I prefer “ultra-brut” sparkling wine and bone-dry Chardonnay) don’t be afraid to add more sugar if that’s to your taste. Grab some herbs from your garden or window box to garnish the finished product, serve with cute straws over ice and there you have it! Shrubs are the perfect potable project for lazy summer weekends and will reward your senses (and your sense of DIY accomplishment) all season long. 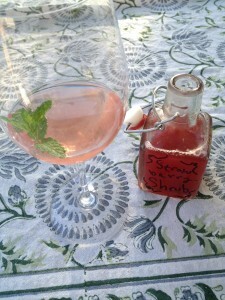 A “drinking vinegar” syrup to dilute with water or sparkling water for flavorful summer sipping. This versatile recipe is inspired by many I’ve read in Victorian and Georgian cookery books, including Mrs. Beeton’s Book of Household Management and Jane Austen’s family’s recipe collection. Yield: Makes about 1/2 cup of concentrated syrup, which will provide 4-6 drinks depending on desired strength. 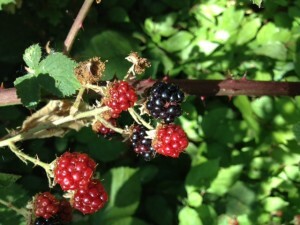 Wildcrafted blackberries from the creeks in our vineyards lend their rich color and flavor to summer drinks. 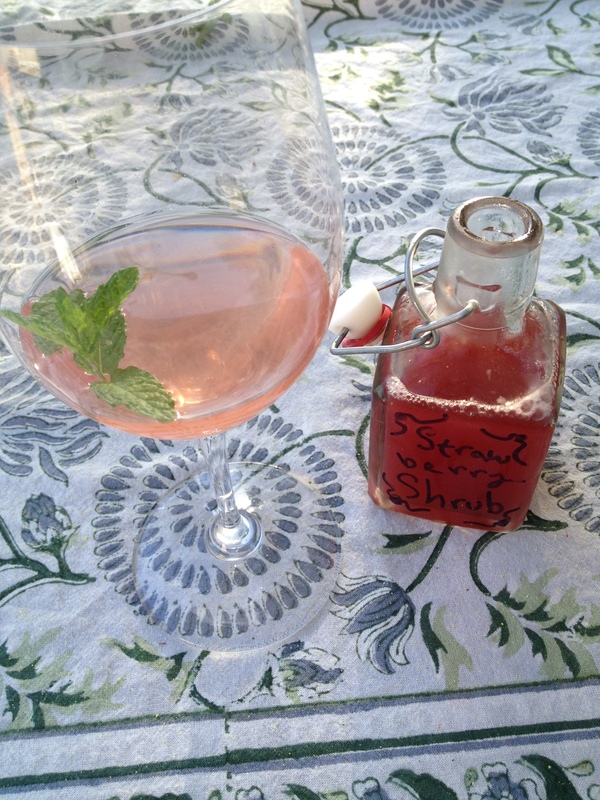 Shrubs can be diluted to taste. I prefer a less-sweet drink with more sparkling water. 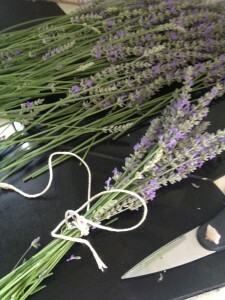 Pick herbs and flowers from your garden to garnish your glasses. When serving, try cucumber slices, mint sprigs, basil sprigs, lavender stalks or citrus peel as garnishes for extra aroma, flavor and visual appeal. Cover the prepared fruit and sweetener with your vinegar of choice. Shake well to combine and dissolve any sugar crystals. Shake twice a day for two weeks, keeping jar in a dark, cool place. Strain contents into measuring cup, gently pressing down on fruit to extract liquid. Pour into clean jar and label with contents and date. Combine 1-2 oz of the shrub syrup with about 1 C cold still or sparkling water, to taste. It is also historically accurate to include a 1/2 oz of rum or an ounce of red or white wine. Garnish as desired. Cucumber and mint are two of my favorites. Fresh apricots waiting to be washed and sliced. Alison Crowe is a Winemaker and lives in an old Victorian house in downtown Napa with her husband and two small boys. Twitter: @alisoncrowewine girlandthegrape.com is a finalist for “Best New Wine Blog” in the 2014 Wine Blogger Awards!